Liverpool manager Jurgen Klopp has provided an injury update on defender Joel Matip after he limped off in a pre-season friendly. The former Cameroon international missed much of last season through injury and only lasted 22 minutes against Borussia Dortmund in a 3-1 defeat. This looks a real worry for the Reds as they urgently need more options and depth at the back after becoming arguably way too reliant on Dejan Lovren, even if he did show some improvement in form in the second half of last season. Matip would be a great option to have for LFC, but he seems to have suffered a new problem early on in pre-season, though Klopp moved to ease fears over his fitness. 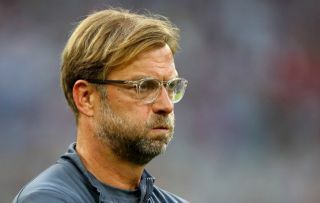 Speaking after the game, the German tactician told Liverpool’s official site that this was a different injury to the one that kept him out last season, but added that the club don’t know the full extent of it just yet. ‘It’s not the same injury. It’s another muscle – it looks like, hopefully, only a little tear,’ the boss said. ‘We will see, but we cannot say anymore about it now. It is of course the most negative thing about the day. It’s not cool. Things like this can happen, but you don’t want them to.